Cinema arrived in Dublin in April 1896 when a demonstration was held in Dan Lowery’s Star of Erin theatre (later the Olympia). 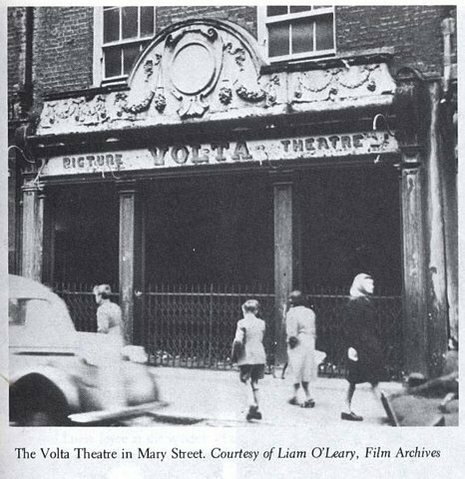 James Joyce was briefly the manager of the first cinema in the country, the Volta Electric Theatre, which opened in December 1909, and where Joseph Simpson of Manor St. was now the Assistant Manager . This sparked the establishment of several other institutions which showed motion pictures (see return for Andrew Bennett of Lower Abbey St., cinematograph operator) . The first film made in Ireland was, fittingly, a tale of emigration made in 1910, called The Lad from Old Ireland. In November and early December Joyce travelled with the partners to explore Belfast and in Cork before stage-managing the inauguration of the Volta Cinema in Dublin on 20 December 1909. The films shown - “The First Paris Orphanage”, “La Pourponniere” and “The Tragic Story of Beatrice Cenci” - were well-received, with some demurs about their lack of obvious appeal for an Anglophone audience and, indeed, the Volta would succomb to the influx of more exciting fare from America by July of the following year when it was peremptorily sold off at 40% loss to the investors.